← What should a button do? So said the fortune which was tucked inside my cookie. What it failed to mention was that I was going to be the one making those new clothes, but otherwise I’d say it was right on target. 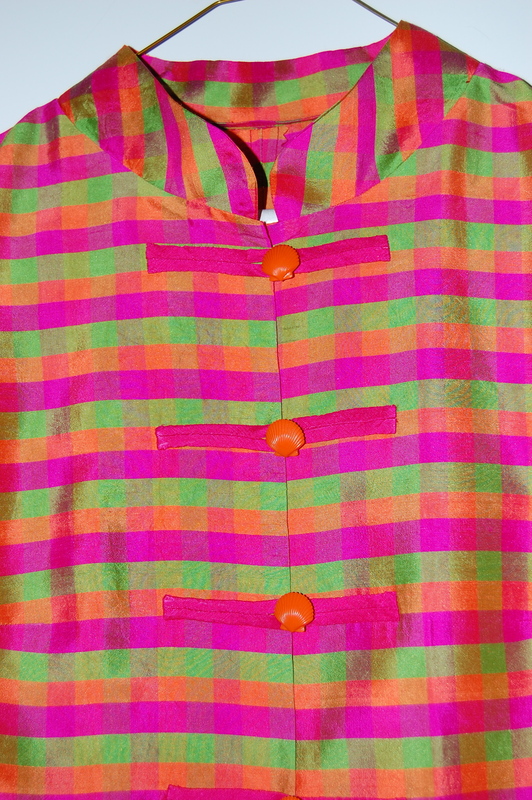 Well, it seemed only fitting that, with this Chinese dictum, and with my burning desire to use those shell buttons (which kind of give off an exotic aura), I should indulge my attraction to Asian-inspired clothing design, and make this tunic my next sewing project. The date on this pattern is 1958. The envelope is in sad shape, but the pattern pieces are fine! 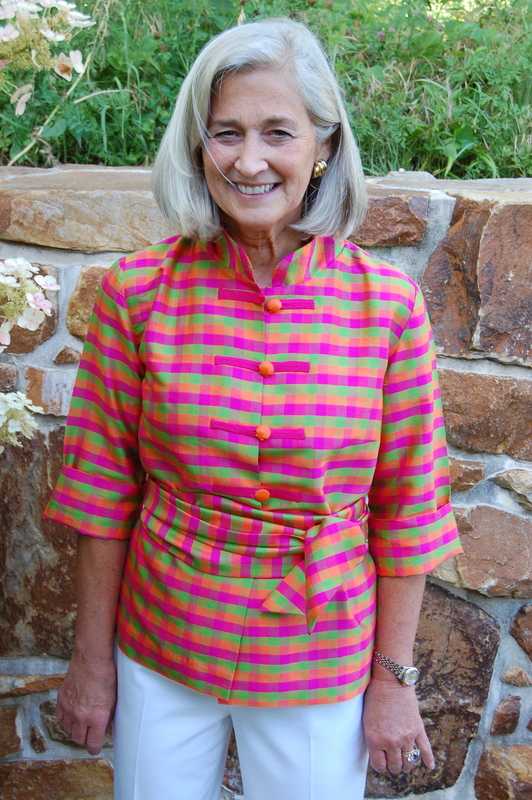 I had another reason, too, to choose this tunic pattern. After my last project, the Pierre Cardin silk dress, I was ready for something that did not need to be underlined or lined – and I was ready for something casual and fun. I might add “bright” to that list, too, as the fabric I chose is indeed that! This is the swatch I ordered from B&J Fabrics. Just a reminder (if you need it) that I wanted to use these buttons for this tunic. 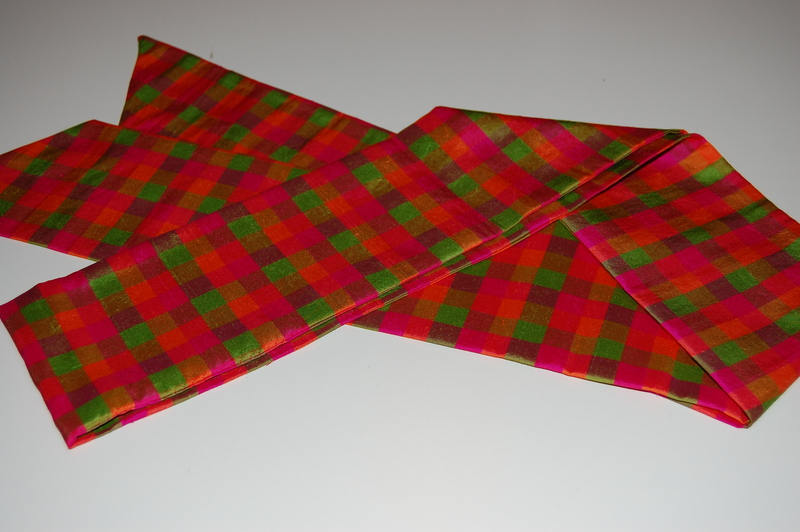 I had the fabric swatch sitting on my ironing board in my sewing room when I started work on my “Pierre Cardin” dress. The pink silk from that dress complimented this silk check so much that, putting the two together seemed inevitable. 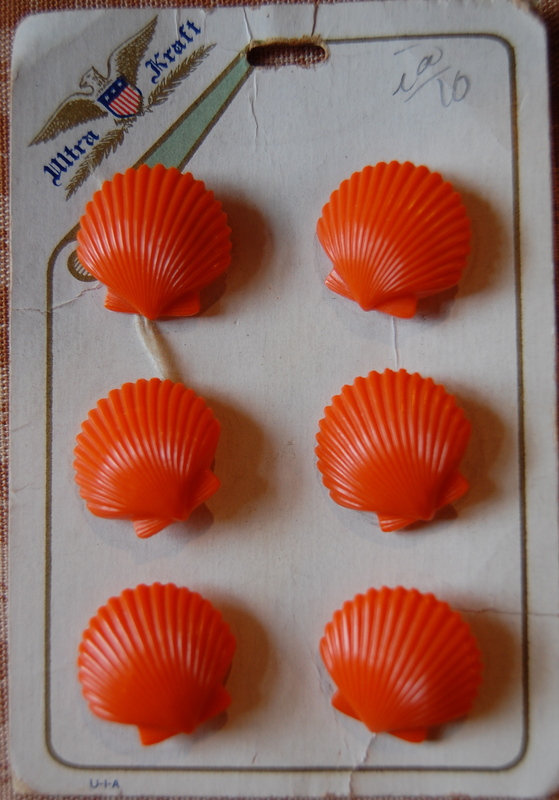 I played around with some small scraps, scrunching them around those orange shell buttons, still on their card. What could be more perfect than making the buttonhole loops and details out of the pink fabric, to set off those shell buttons? I was sure that would be much more effective than making the loops and details out of the same checked fabric. First, of course, I set out to make a muslin. When I opened the pattern, the pieces for the dress had been previously used, but not the pieces for the tunic. The collar was universal for all three views. However, in addition to the tissue collar, there was a collar piece cut out of newspaper. 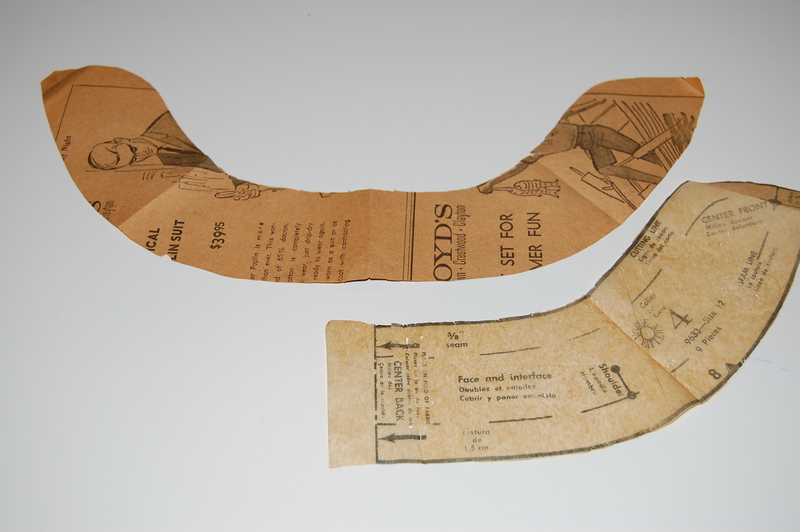 Here are the two pattern pieces for the collar – the top one cut by the original home sewer. 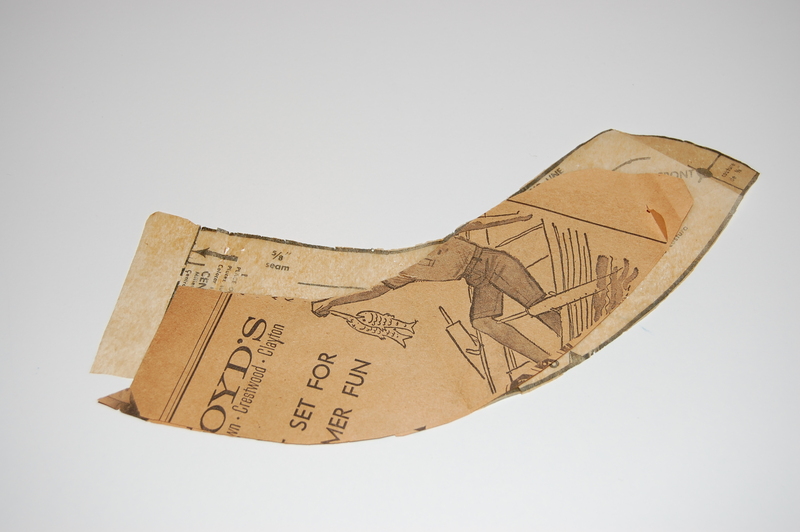 There was nothing written on the instruction sheet or envelope to explain this mystery – and it appeared that the “newspaper” collar was shorter in length than the tissue pattern. Here you can see the newspaper pattern is shorter than the tissue one. As is my method of approaching a new project, that is, getting a few things constructed before I need them, I decided to make the obi sash first. I just kind of guessed for width and length, making it 4” wide (finished width) and 77” long, so it could go around me twice comfortably with a double knot in front. Next I made the button loops and details. The pattern didn’t give too much instruction on these pieces, other than the length they should be and the finished width (1/4”). 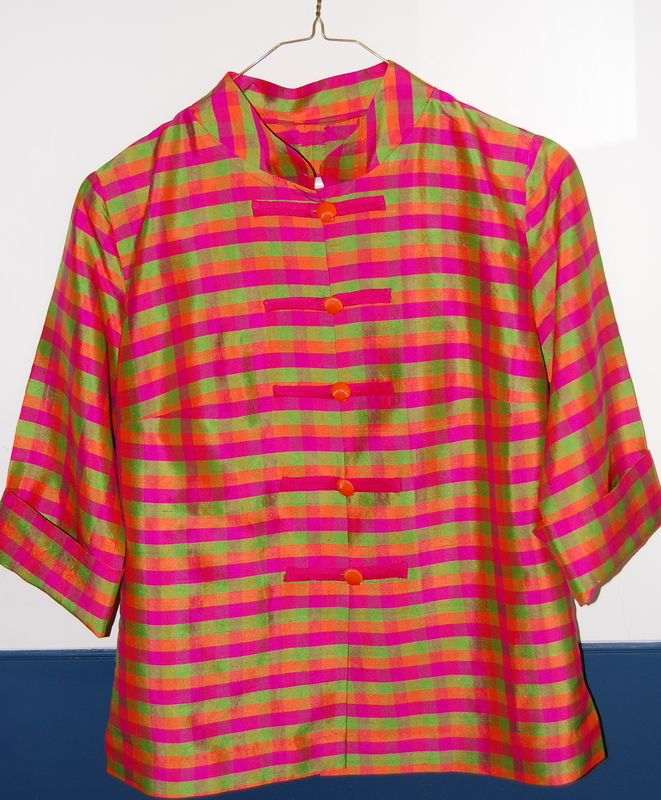 (I should mention here that I decided to put 5 buttons on the tunic, not 4 as is shown on the pattern.) I cut bias strips 1”wide, folded them in half lengthwise, sewed the seam twice and turned them with a bodkin. Nice and easy! I put flat-felled seams in the sleeves and added interfacing to the front edges even though the pattern did not call for this. The most time-consuming part of the whole thing was hemming the ends of the buttonhole loops and details and then sewing them onto the tunic. But that’s really what the project was about – showcasing those buttons in an appropriate way. The finished tunic, with the sleeves folded up, as they are supposed to be. 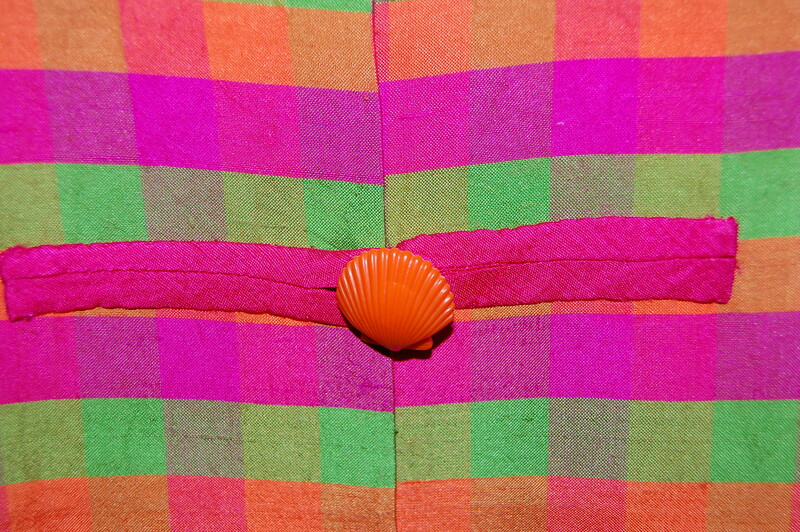 A close-up of the front, with the button detailing. An even closer look at one of the buttons and loops. This photo will make my daughter very happy! Here I am modeling my new tunic, with sash. I think it works – what do you think? One final thought: fortune cookies are a little like potato chips (or chocolate!) – it’s hard to eat just one. Yes, my first cookie was followed by another one – and I was hoping for a similarly enticing fortune. Imagine my surprise when my second fortune was exactly the same as the first one! lol – what a great fortune! Even better that you got it twice in a row! I love the colors of your plaid fabric! You are right, the solid pink skirt would be perfect for the tunic. And it is so nice to see you modeling it! It looks so different on the hanger compared to a real body with the sash to finish it off. It’s beautiful! Thanks, Brooke! This fortune (doubled) was almost too good to be true! It’s definitely my most memorable cookie ever! I love the bright colours! I looks lovely! Thank you so much! A check with three of my favorite colors all together was irresistable. So you must be on the right craft then huh? This jacket is gorgeous. I love the sash and the buttons are just right. Yes, I think sewing is IT! Thank you so much for your lovely comments! I love it! It looks so sleek and fashionable and you wear it well. Thank you, Kerri! I think I’ll get lots of use out of this tunic! This is just beautiful. I’m so glad you modeled it “in person”. Showing it on a hanger would not have done it justice. Keep it up–I’m loving it! Thanks, Barbara!! My next project will be a bit more complicated than this one… unless I decide to make a pink silk skirt first! What a great top. I love the white pants with the bright silk! Thank you, Cissie! Wearing white pants with this top was an easy decision for sure! 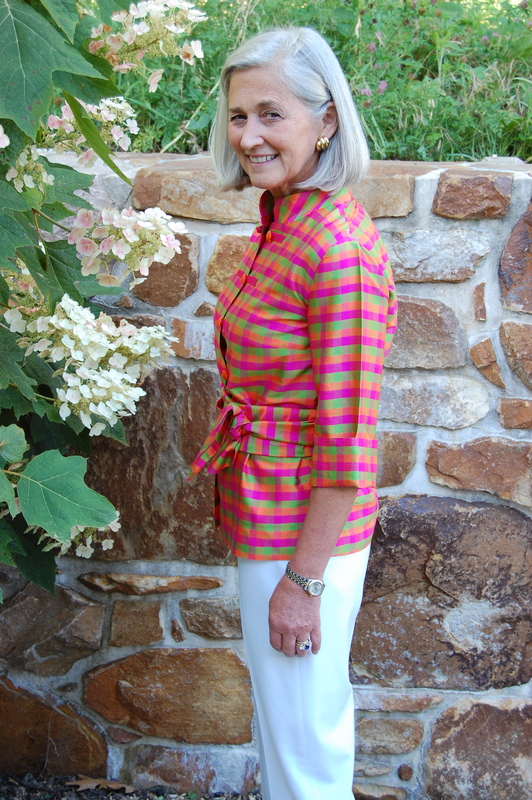 I just love your tunic – so happy, cheerful and fits you so nicely! How come all my fortunes say stuff like “You need to pay your bills”? Anyway, with a fortune like that, how could you NOT make something fabulous. I love the tunic and how it looks on you. Thanks, Lizzie! It’s more fun when there is a story behind a piece of clothing – and this tunic certainly has a story! Thanks, Sarah! Yes, time to buy more hangers and get ready for all these new frocks headed my way! Wow! It looks wonderful! I espec. like the way you used the pink silk to highlight the buttons. Now, what to do with that 6th button! Put it on the tip of the sash,perhaps? I’m so glad you like it, Nancy! I know what you mean about that 6th button. I thought it might be best to leave it attached to its card for posterity’s sake. Also, a sewing rule my mom always had was to have at least one button in reserve in case you lost one! I imagine other home sewers had the same rule – and that is why there are so many “single” buttons found in old button boxes! Thanks, Alice! I always get compliments when I wear it, which is lovely….